* Seat Height: 14 in. We took old-world outdoor furniture style and added new-world innovation. The lines are timeless, bold, sculptured - capturing a classic look of individuality and purposefulness. All of our commercial sling chaise lounges say "rugged loune furniture" and with its all aluminum construction, it's as tough as it looks. Only 100% pure virgin vinyl is used in our strap composition and straps are available in many different colors. 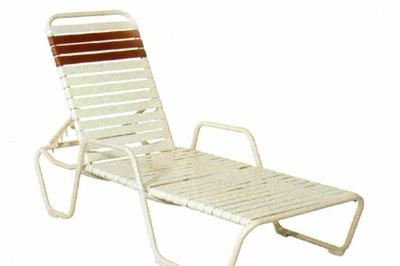 Our commercial strap will not sag after repeated use making it the ideal furniture for any resort or hotel poolside deck.